Through what tragedies can Friendship endure? The Grizzled is a fast-paced, fully cooperative card game for 2 to 5 players that takes place in the trenches of World War I. 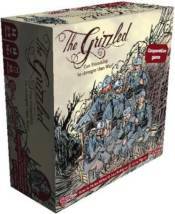 Already a best seller in Europe, The Grizzled is an elegant game of avoiding threats and leading a team, and is regarded as one of the finest cooperative games ever made. Featuring beautiful art by French artist, Tignous, The Grizzled�s outstanding art is the perfect complement to its message of peace and enduring friendship.